Lightbulb bakery… Open for Business! Last night, I had a flashback. It was circa a long time ago (ahem, a lady never shares her age) and my best friend had gotten the latest, greatest kid cooking gadget ever. No, it didn’t use microwave technology but something far better… A lightbulb. I remember sitting up in her room and reading the instructions carefully, getting a bit of water from the sink and stirring our recipes. Oh how delicious they tasted! Oh, wait, no they didn’t! But it was raw batter and we were kids so it was all good. Well, Santa, after about a good 6 months of requesting, brought a lightbulb baking machine to our house for Christmas. My little baker was ecstatic. I thought, er, I mean, Santa thought that he had improved on lightbulb cooking technology over the past few years so why not give it a try. After all, the little lady loves to cook and this way, she could do more on her own. The machine had of course been used prior to this, but alas, the mini cupcakes did not taste as good as my mini baker had hoped but with her creative spirit in tact, she wanted to try, try again except with a different recipe packet. As the oven heated, ingredients were poured, measured and stirred. The recipe called for the brownie mix to be rolled into balls and then rolled out into long twists but the batter was quite sticky. I had not helped up until this point but in seeing all of the batter slowly go onto my daughters hands and stay there, I suggested we just make a thin, layer brownie instead. She agreed and in they went. 12 minutes later, they came out. Raw as if they had just gone in. The outside was not as tacky as it had been before, so my daughter attempted to ball up chunks and then roll them out per the recipe. She put them back into the oven for another round of baking in their new and improved forms. Out they came, raw. Back in again. Out they came raw, back in again. We moved on to getting ready for bed as they continued to cook. Out and back in again. 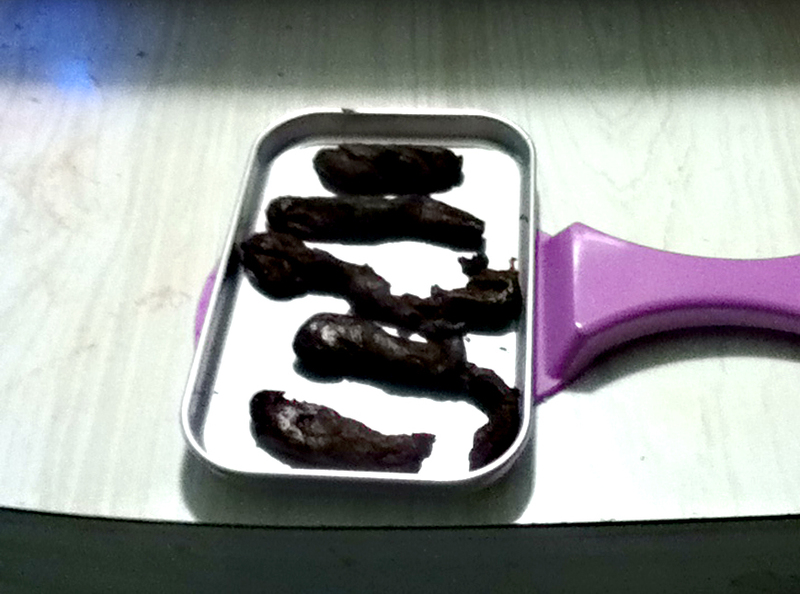 After about 60 minutes of cook time, with my daughter up stairs reading patiently, I pulled the brownies out yet again. I attempted to pick one up to see if they would stand up to gravity for eating and my hubby saw me. His gasped. “WHAT is that? !” Holding the little, brown misshapen delicacy at one end between my index finger and thumb, I looked at my daughters creation in a whole different light. Still slightly raw, it started to stretch and plopped onto the tin with a thump, only strengthening the effect and the ensuing laughter response. I haven’t laughed that hard in a long time and trust me when I say that potty jokes are not my thing. The likeness however was unmistakable. I was so invested in the process at this point that the product was a treasure so I hadn’t seen it. These little blobs were my daughter’s work of art. Looking at the dessert now in a new and different way, I put them back into the oven. And I did not tell my daughter what happened. And so, with all of her siblings making similar statements as they chomped down on their brownies, the lightbulb bakery was a success. My daughter did it all on her own and was so proud for it. She was happy to share what she had made, regardless of its appearance. What a simple attitude to take as each of us creates, don’t you think? I made it and I love it and I am happy to share. I think this time, however, I won’t share the recipe. I am sure you won’t mind.